This Intel Atom x7-Z8700-powered tablet for gamers hits the market as previously announced - just in time for the holiday shopping season. 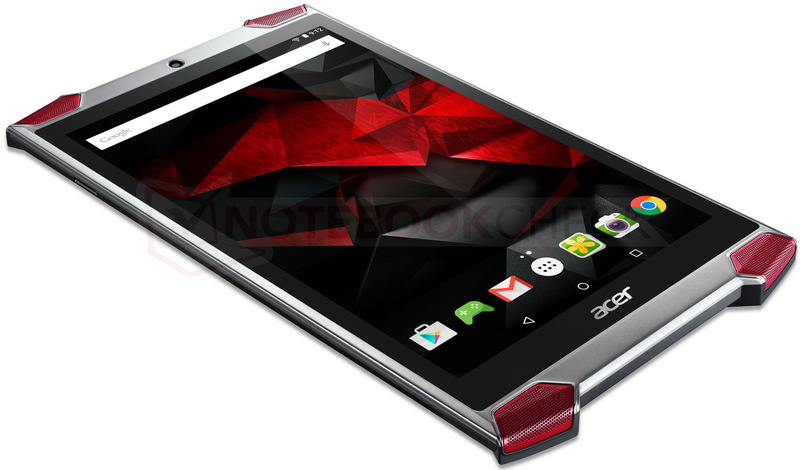 Acer unveiled the Intel Atom-powered Predator 8 gaming tablet back in early February, at IFA 2015. In August, insiders familiar with the matter revealed that mass production of this Android slate for gamers has begun, and it could hit the market just in time for the holiday season. Now, that rumor becomes reality, as Newegg has the Acer Predator GT-810-15NC up for pre-order, listing its release date as 11/17/2015. The model listed by Newegg has 32 GB of internal storage and - apparently - Android 5.0 Lollipop, but since Acer announced the slate would come loaded with Android 5.1 Lollipop, this is most likely a typo. The other specs include an Intel Atom x7-Z8700 processor, 2 GB RAM, a microSD slot, as well as a full HD IPS LED-backlit 8-inch display. The special features of this tablet include Predator Quadio virtual surround (four front-facing speakers) and TacSense (vibrations for an improved gaming experience). The cameras are nothing special - 2 MP front and 5 MP on the back. This worthy competitor to the NVIDIA Shield tablet can be pre-ordered for $299.99 USD. The 64 GB version will probably come out later.